The Department of Scientific Research of the British Museum will host a one-day symposium, featuring innovative approaches to the conservation and scientific investigation of wall paintings. The aim of the symposium is to become a meeting place where conservators and scientists working on wall paintings can exchange their knowledge and experience, facilitating new collaborations. Scientists will become familiar with the existing conservation challenges and conservators will update their knowledge about the most recent scientific developments. The symposium will be conducted in English and, thanks to funding from the Andrew W. Mellon Foundation, it will be free of charge. However, booking a place in the symposium will be necessary. More details can be found in the Registration section. Oral presentations will be of 15 minutes (unless differently specified) with questions at the end of the sessions. It is extremely important that speakers respect the time limit. Poster boards have a dimension of 100 cm x 100 cm, therefore posters must be in portrait format and A1 size (84.1 x 59.4 cm). 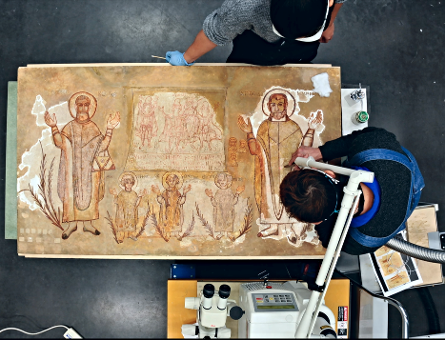 Laser cleaning of a Byzantine wall painting from the BM collection. © Trustees of the British Museum. The symposium is organised by Dr Lucia Pereira Pardo and Dr Lucia N. Melita, Andrew W. Mellon Postdoctoral Research Fellows at the British Museum.